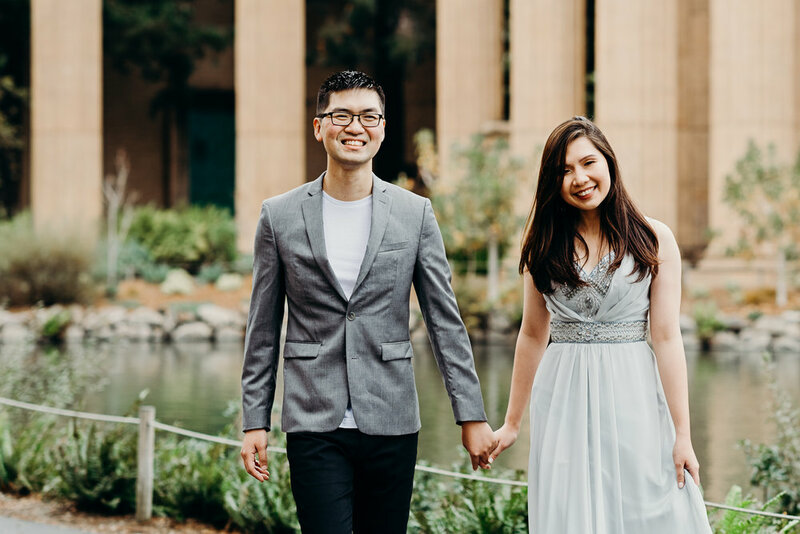 Liezl and Alex already have a wedding photographer for their wedding in San Francisco next year, but I am so happy they let me tag along with them to the Palace of Fine Arts Theatre and Cupid's Span to take some engagement photos of them anyway. It was a little chilly, for San Francisco that is, but Liezl and Alex braved the cold and got all dressed up for my camera. As I worked on editing their photos and putting together this blog post, I couldn't help but remember how fun this couple is, and I hope it shows in their photos! They were full of smiles and laughs, and it was pretty clear how much they light up each other's lives. I'm actually pretty jealous of their wedding photographer, because for as sweet as these two are, I am sure their families are pretty awesome too! Congratulations Liezl and Alex! I look forward to seeing your second set of engagement photos and your wedding photos too! !